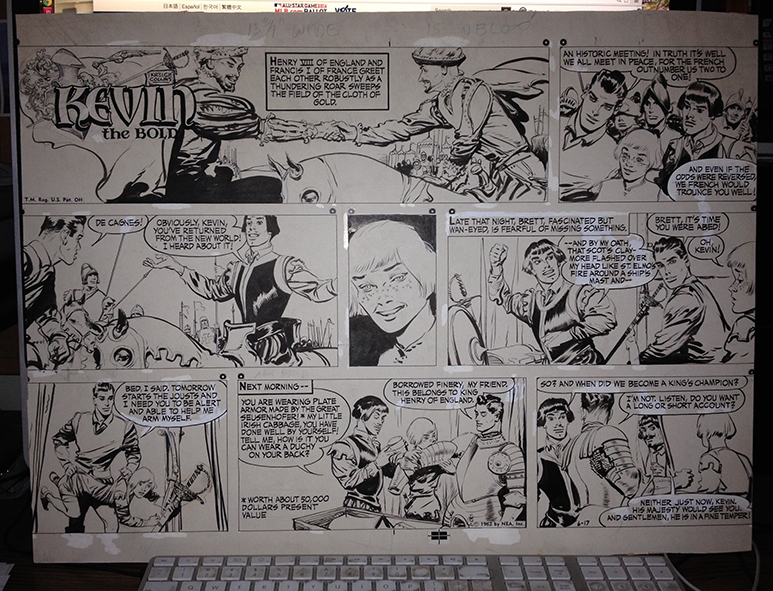 Common formats for Sunday strips include the half page, the one-third page, the tabloid page, and the half-tab. Usually, only the half-page format is complete, with the other formats dropping or cropping one or more panels. Such “throwaway” panels often contain material that is not vital to the main part of the strip. Collectors generally value half pages the most, since the other formats are incomplete by comparison. Half-tabs have approximately the same aspect ratio as half-page comics, so while their printed size is quite small (10″ x 7″ vs. 14″ x 10″ for half-pages), at least the reader sees all of the artwork. 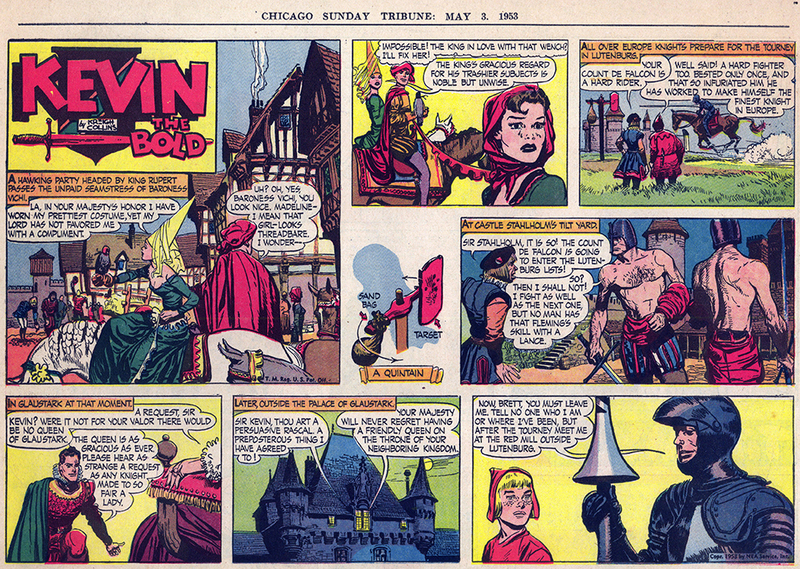 The half-page version of the October 27, 1957 episode of “Kevin the Bold” is shown above. 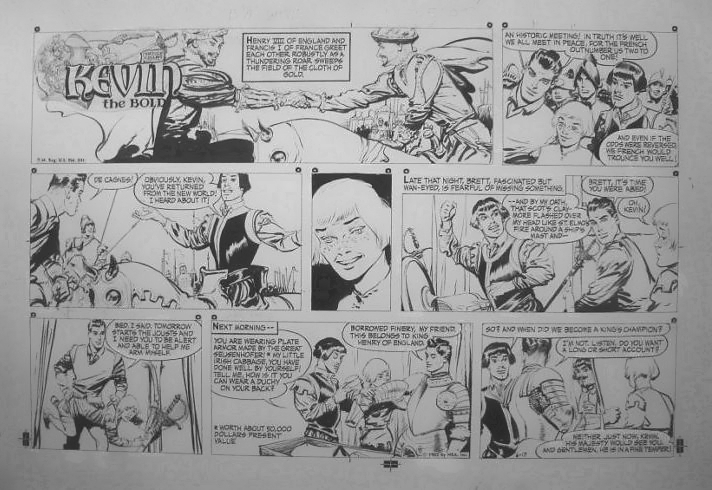 When Kreigh’s comics appeared in tabloid papers, the small center panel was generally the throwaway. 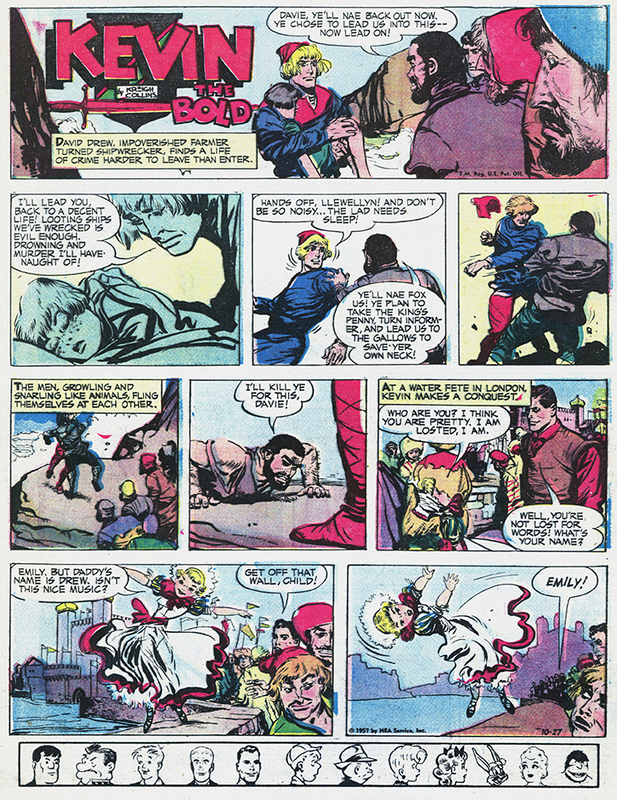 When they appeared as one-third pages, severe cropping could occur (in addition to losing the throwaway panel). The storyline would continue but the impact of the comic was lessened. 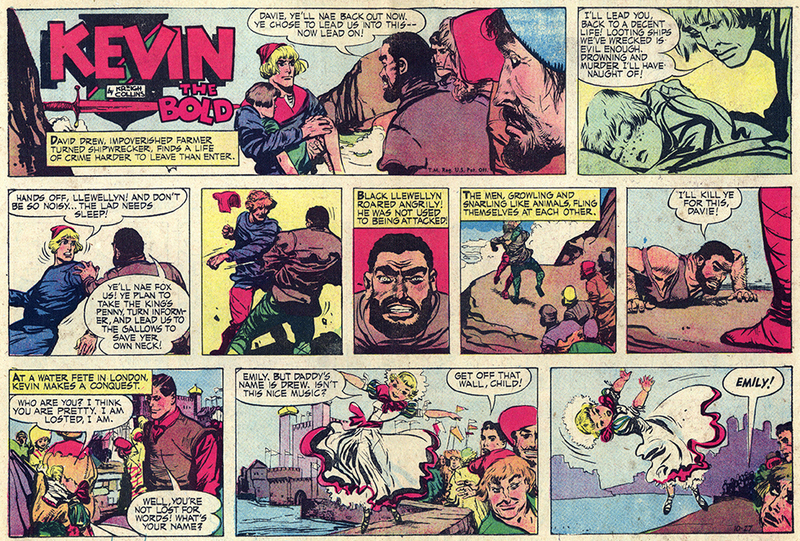 Below are tabloid and third-page versions of the same comic. In this case, Black Llewellyn’s scowl is the throwaway. Too bad! And in the third-pager, each panel is cropped both left and right. At bottom, examples of the “Kevin” that ran on October 19, 1952 show an even more unfortunate example of the cropping that could occur. (This strip also has an appearance by Leonardo Da Vinci. 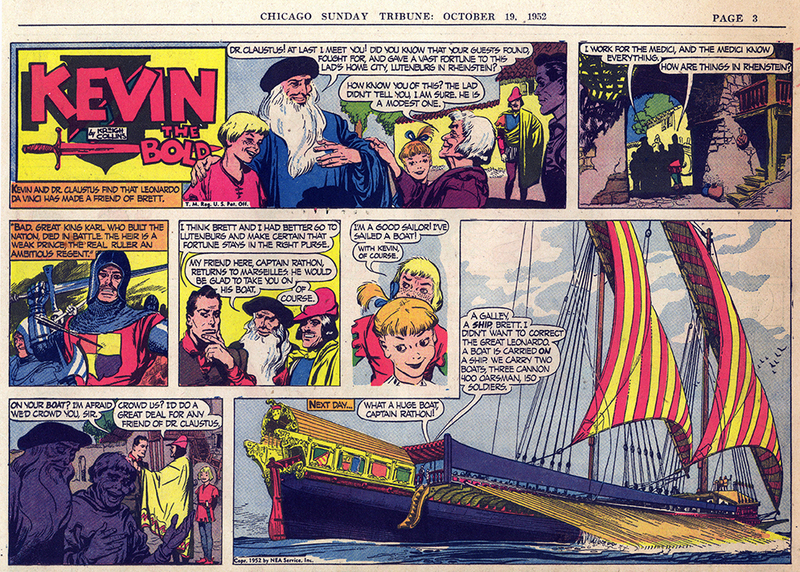 Leonardo would also show up toward the end of “Kevin” ’s run, in 1967). 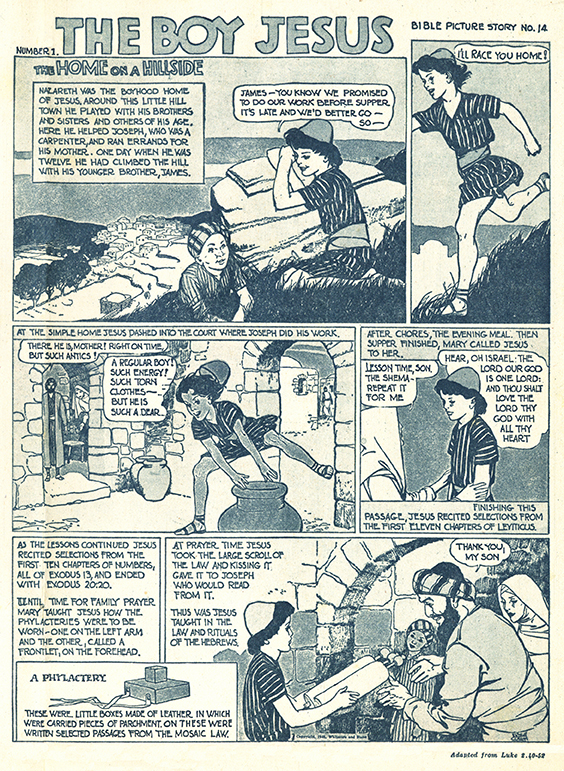 Comic-strip technique was being applied to religious stories in a new way in order to increase their appeal to children. 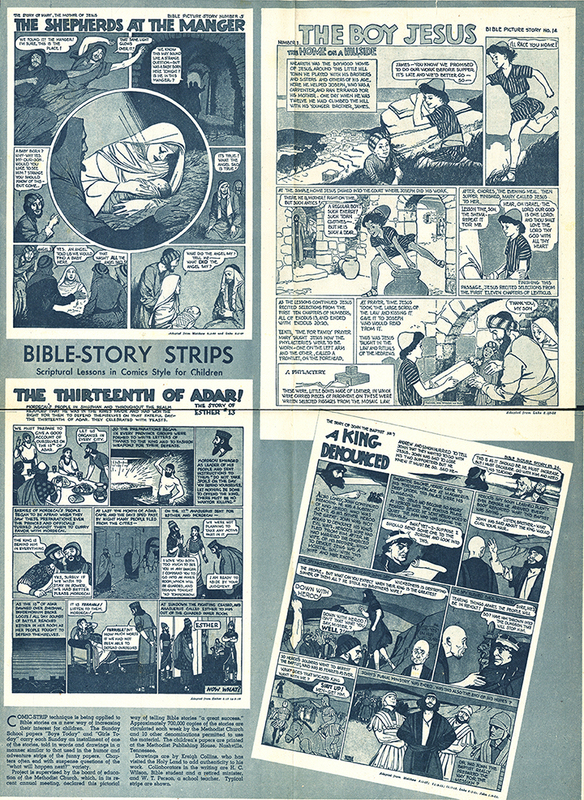 The Methodist Church’s board of education declared this pictorial way of telling Bible stories a great success, and approximately 700,000 copies of the stories were circulated each week. Chapters often ended with suspense questions of the “what will happen next?” variety. An item in the March 10, 1946 St. Louis Post-Dispatch (top) described the phenomenon and featured several of Kreigh’s comics. The blurb said that Collins had “visited the Holy Land to add authenticity to his work,” but it is more likely the authenticity was provided by hundreds of hours spend doing research at local libraries. 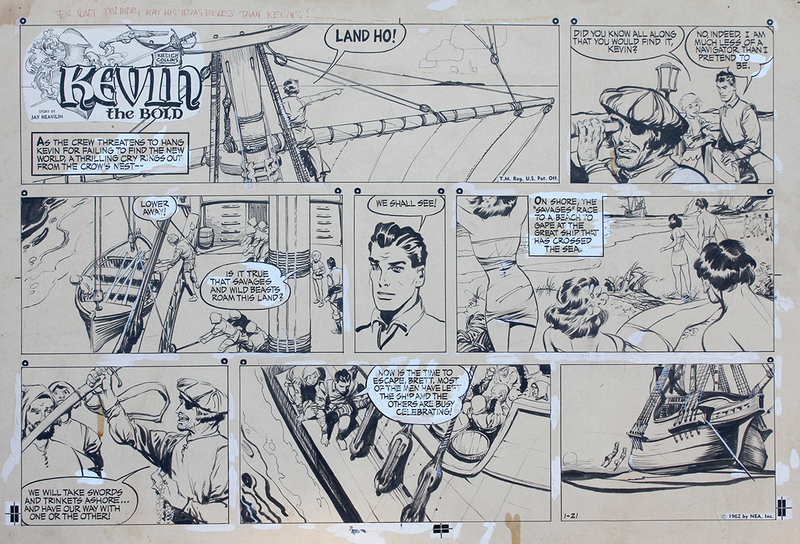 These early comics showed examples of Kreigh’s style and devices he would employ throughout his career. Note the distinctive lettering, the use of descriptive inset illustrations (above, a phylactery; below, a quintain), and even Jesus’s pose, as he leapfrogs the vase (compare to Brett, at bottom, from a 1955 Kevin). Original pieces of Kreigh Collins’s comic strip illustrations are quite amazing. They are large (drawn on 20 x 30″ illustration board), rich in detail, and interesting in other ways — corrected areas are readily apparent, stock elements are revealed to be pasted in, and instructions or notes are sometimes written in the margins. In the example shown above, Kreigh (my grandfather) personalized the illustration and gifted it to my other grandpa (“For Walt Palmer, May his trials be less than Kevin’s!”). Unfortunately, the art has a bit of wear and tear due to hanging on my brother’s bedroom wall through high school and college. He gets a pass as he shared a name with Kevin’s young ward — Brett accompanied Kevin on many of his adventures. Originals can occasionally be found at auctions for a couple hundred dollars or so, depending on their condition. Another original I own was in quite nice shape when it was offered for sale about ten years ago. But by the time I won it on ebay in a later sale, its edges had been hacked down to fit into a cheap 18 x 24″ picture frame. I suppose its value has taken a hit, but I didn’t buy it as an investment. For me, it’s all about the family connection. After illustrating 100 episodes of “Mitzi McCoy” and nearly 1,000 of “Kevin the Bold,” Kreigh Collins decided to create a new semi-autobiographical strip featuring the adventures of a sailing family. Kreigh Collins’ credentials to create and draw “Up Anchor,” America’s first color comic strip devoted to boating, are as bona fide as the burr on a thistle. 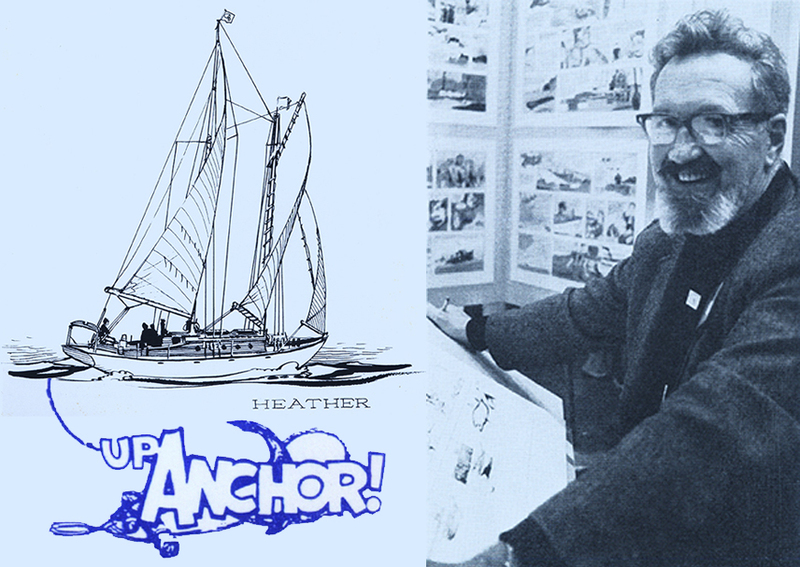 Collins is a sailor and for many years has skippered the family schooner Heather. Heather serves as a floating studio during the summer. Like most boaters, Kreigh started with a small sailing pram and graduated by degrees to the 47-foot Heather over a 30-year period. With Kreigh at the helm, Heather has plied the Great Lakes, the inland waterways of the mighty Mississippi, ridden out storms on the Gulf and found snug in Mystic, Conn. Home port is Ada, Mich. The unique aspect of “Up Anchor” is that — unlike most Sunday comics — it is not fantasy. Kreigh conceived the idea for the strip on a family cruise. So the strip itself reflects real people in real situations. Finding typical family situations afloat poses no problem for author Collins. Twin teen-age boys and wife Theresa (called Ted) provide a wealth of background for both the fun and serious sides of boating situations. Through “Up Anchor,” Kreigh is trying to generate an appreciation of the sea, provide essential information for new converts to cruising pleasures — and, in fact, attract more people to this increasingly popular leisure time activity. (from a promotional folder sent to newspapers upon the launch of “Up Anchor” in the fall of 1968). Above, “Up Anchor” from March 15, 1970.